It's 28 degrees outside. On black roofs at 1:00 PM, we have observed temperatures of 43 degrees Celsius. However, the temperature among the plants is a considerably cooler 30 degrees. However, what's more important is the temperature under the soil, as plants do not like having hot roots. It impedes them from growing and functioning correctly and damages cells in the roots. High soil temperatures in Dutch climates are rare, as it simply takes too long to heat the ground to any substantial depth. However, on standard green roofs, the temperature on the thin, dry substrate layers can elevate rapidly. Today, we measured a substrate temperature of 33-35 degrees on the control roof (a standard green roof). This is far above the maximum level that plants generally prefer (20 degrees). 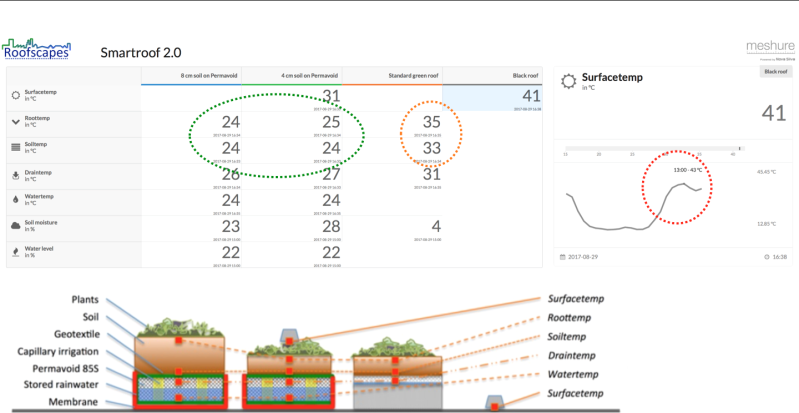 However, in the blue-green structures of Project Smartroof, where rainwater is stored under the substrate layer, we have measured much lower root and substrate temperatures of between 24 and 25 degrees. It's still warm, of course, but at least ten degrees cooler than standard green roofs that don't capture water. 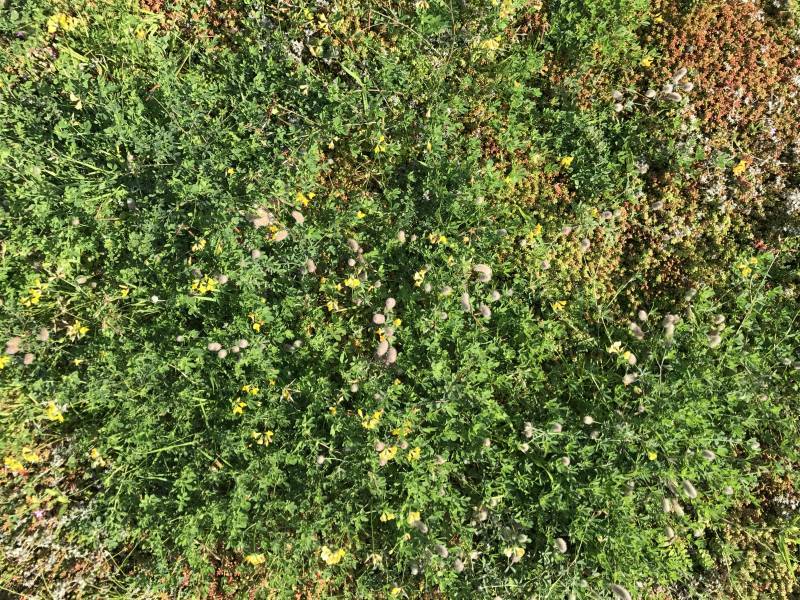 You can immediately see the difference in the plants: those on the standard green roofs turn red to protect themselves against the heat and dryness, while the plants in the blue-green testing areas retain their lush green colour and continue to grow. This enables them to optimally cool the surrounding area on hot summer days. Two photos taken on 28 August 2017. On the left you can see the plants in the Permavoid Blue-Green system, with a 4 cm substrate layer. These plants appear green and healthy. 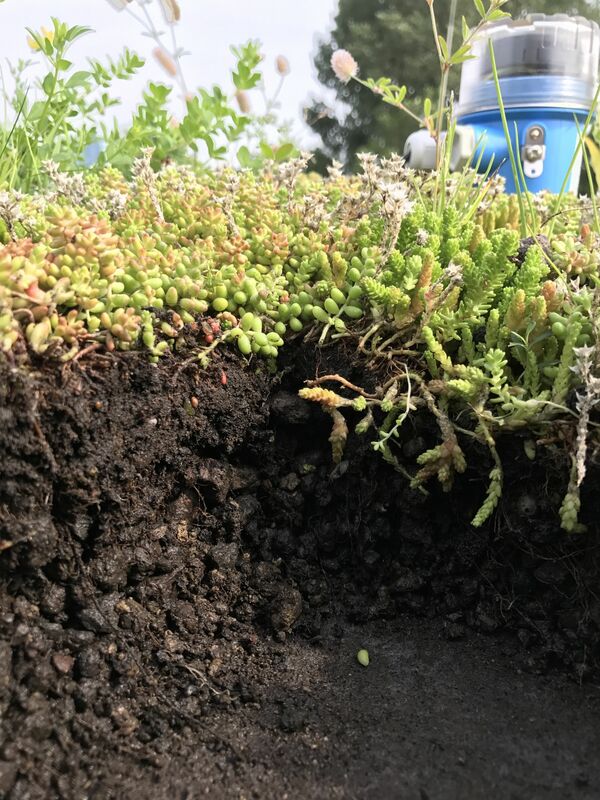 On the right are the plants in the standard green-roof system, also with a 4 cm substrate layer. 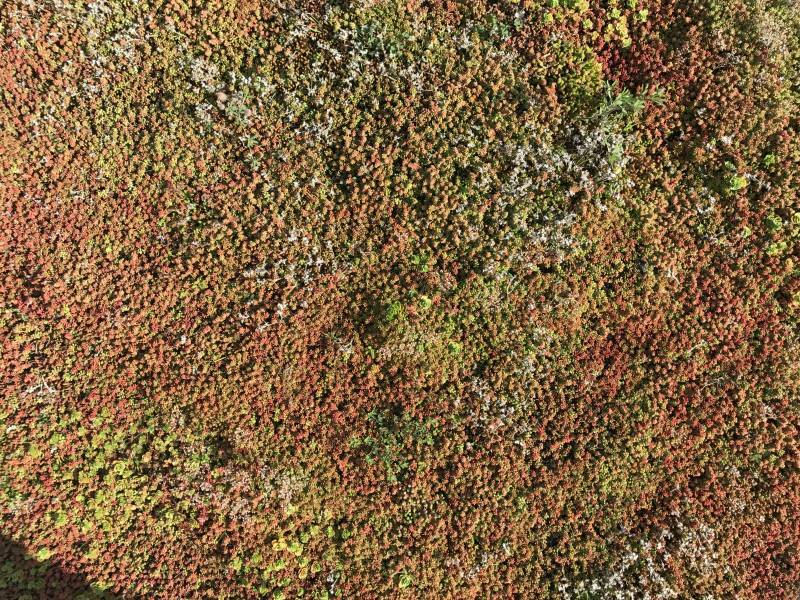 Here, the plants have already turned red as part of the Sedum's well-known survival mechanism, bowing their heads to the heat and dryness.